Theresa Rebeck, the remarkably prolific creator of this entertaining one-act, prefers her comedy to be character-centric rather than based on single jokes. In The Understudy, she creates three fascinating actors at various levels of success in the theater world. The play has a lot to say about art, love and commerce in the twenty-first century. Mike Dooly, Brenda Joyner and John Ulman are a delight to watch as they plough through a rehearsal for a deep, sinister Kafka three-act. Dooly is Jake, the well-paid movie star who has returned to the stage for the love of the craft, but still awaits a phone call for that really big screen role. Joyner is a jilted lover who has lost her confidence as an actress and now has re-aimed her somewhat manic energy at stage-managing. Ulman plays the understudy, just thankful to be paid to rehearse. During the course of the evening, each is given their moment on stage and adroitly answers the demand. Ulman is particularly effective when Kafka’s darkly absurd play too closely approaches his own predicament. Rebeck gets a lot of mileage out of the play-within-a-play format. As their tortured rehearsal continues, their project reveals more and more about the actors and what they really want out of their profession and their lives. The whole package makes for a humorous, thought provoking and touching night at the theater. Director Kelly Kitchens really lucked out getting three of Seattle’s best actors to work with her and does wonders with them. Richard Schaefer had his work cut out for him as scene designer; the play demands a lot of big doings for this small space. Kathryn Van Meter is responsible for a very unique and effective dance number. Sound-Dustin Morache, Costumes-Michael Notestine, Prop Design-Max Pagel. 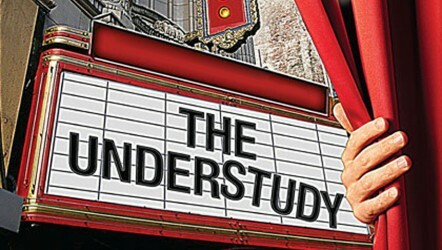 The Understudy plays though February 17 at Seattle Public Theater at The Bathhouse on Green Lake. Ticket information: 206-524-1300 or online at www.seattlepublictheater.org.